Occasionally I find myself stalking writers. 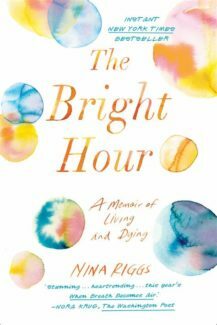 Upon finishing The Bright Hour, a real-life story conveyed in tender and meticulous language, I wanted to email Nina Riggs right away. I needed to tell her that I loved her memoir more than any memoir I’ve read in months. It was bold and brave and funny. It made me cry, and it made me want to sip whiskey with her on her front porch in Greensboro, North Carolina, and I don’t even like whiskey. But then I remembered that Nina Riggs is no longer alive, and it was like a punch to the gut. She completed the manuscript for The Bright Hour in January 2017 and passed away a month later. This loss of her is shattering: not just for her husband and two sons, but for the many readers like me who might be a little obsessed with her command of words. Riggs, who died a few weeks shy of her fortieth birthday, was diagnosed with triple negative breast cancer at age 37. What started as one small lump morphs into something incurable and metastatic, and all hope for long-term survival is lost. Without hysterics or self-pity, she tells her husband, John, “I have to love these days in the same way I love any other. There might not be a ‘normal’ from here on out.” And she sticks with it: she drinks beer with friends, takes John to Paris, and shops online (obsessively, hilariously) for the perfect couch for her living room. The Bright Hour is about these exquisite ordinary moments she carves out for herself and her family—shoved in between hospital visits and chemotherapy sessions. P.S. I stalked Nina Riggs online anyway. And to my surprise I stumbled upon this, which directly relates to another of my favorite memoirs. Have a tissue ready.